On Thursday April 6, 2017, two American naval vessels fired 59 cruise missiles towards the Al-Sharyat airbase in Syria targeting the facilities and airplanes stationed there. The official reason behind the strike was that it was in response to a government chemical weapons attack a few days earlier on April 4th at Khan Sheikhoun, Syria. Initial reports of the attack came from a Twitter video, and eventually images of those suffering the effects of chemical weapons, either Sarin or Chlorine, began appearing on the screens of American televisions. Most importantly these images, apparently shown to the President at the behest of his daughter Ivanka, stirred enough in Donald Trump to do something, as Fareed Zakaria described it, very presidential. The president of the United States, regardless of what Donald Trump believes, does not have the power to attack a sovereign nation without cause. In order to conduct a strike like the one launched on April 6th, the president should have a level of confidence on the facts to justify the use of force. The crux of the issue in this latest Syrian attack is whether the facts presented are sufficiently supported by evidence. If it is, then the president can, under one international “norm,” respond with military force. The State carries the primary responsibility for protecting populations from genocide, war crimes, crimes against humanity and ethnic cleansing, and their incitement; the international community has a responsibility to encourage and assist States in fulfilling this responsibility, and; the international community has a responsibility to use appropriate diplomatic, humanitarian and other means to protect populations from these crimes. If a State is manifestly failing to protect its populations, the international community must be prepared to take collective action to protect populations, in accordance with the Charter of the United Nations. As laudable as this norm sounds, one cannot ignore the very recent history of R2P and the distortion it provoked in Libya. 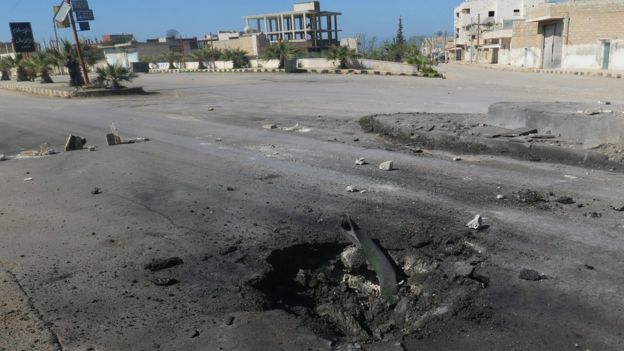 The transition of a UNSC authorized R2P intervention to protect civilians in Benghazi turned very quickly into a robust air campaign aimed at regime change from the above. Given the position of the U.S. regarding Syria (“Assad Must Go”) there is every reason to believe that the invocation of R2P in Syria is in line with the standing U.S. policy of regime change. Though the end of the Assad regime is an understandably desired outcome (despite fears of who, or what power, would replace the regime), it is not the goal of R2P to remove sovereign leaders. As such, the official policy and historical tendency of the United States stands as a barrier to any legitimate use of R2P. Unlike Libya, the Syrian proxy war makes the prospect of mission creep to regime change that much more serious and dangerous. Add to that the position of Russia as a staunch ally of the Syrian government, and the potential for international war becomes more ascertainable. Since the attack, two narratives have been pushed by the two sides of the conflict. First, the United States, Britain, Turkey, and its anti-Assad allies claim to have evidence, irrefutable evidence, that the attack came from the air and contained chemical agents deliberately delivered onto civilian targets. If indeed the case, the attack – when compiled with all the other attacks in Idlib, Aleppo, and elsewhere in Syria – make it clear that the regime of Bashir Al-Assad is responsible for innumerable war crimes, crimes against humanity, and potentially genocide. However, the Syrian government categorically denies the use of chemical weapons as does the Russian government. “I stress to you once again: the Syrian army has not, did not, and will not use this kind of weapons – not just against our own people, but even against the terrorists that are targeting our civilians indiscriminately,” he said at a press conference in Damascus posted below. The government claims that, as Sputnik reported Russian Defense Ministry spokesman Maj. Gen. Igor Konashenkov affirm, that Syrian aircraft conducted an airstrike in the eastern outskirts of Khan Shaykhun on “a large warehouse of ammunition of terrorists and the mass of military equipment.” Konashenkov said that this warehouse was storing, chemical weapons ammunition militants were preparing to deliver to Iraq. He added that there were workshops for manufacturing bombs, stuffed with poisonous substances, on the territory of this warehouse. He noted that these munitions with toxic substances were also used by militants in Aleppo in November of 2016. So there are two narratives, and there is some overlap in them. Neither side denies the presence of a Syrian Su-22 fighter/bomber in the area. No one disputes an attack took place at Khan Sheikhoun. Neither side disputes that chemical agents were present and that the victims show signs of being exposed. The question is then: what happened, who can we believe? In the western press the proposed Russian explanation is laughed off, mainly because it is Russian. The other method employed is to use the phrase “experts disagree with the Russian explanation,” while linking to another one of the outlets stories which does not contain any detail besides either unsupported claims that “rebels in Syria don’t have the capability” or “it isn’t a plausible explanation.” The New York Times even had the nerve to claim that the UN report on the 2013 Ghouta attacks been carried out by the Syrian government. The report specifically states that it did not find sufficient evidence to determine the responsible party, only that the attack occurred and gas was used. These media outlets are sure that few readers will doubt the official line being repeated and if they don’t, that frustration behind not finding the evidence will prompt the reader to give up and assume some deep state organization like the CIA has the requisite information. Of course, that must be kept secret from the American people. In non-western, or pro-Russian press, the idea that Assad would use his chemical weapons against his own people is not only irrational, it defies the actions of the Syrian government in its attempts to rid itself of its chemical weapons stockpile after the 2013 Ghouta attacks and following UN resolution 2118. Indeed, given the use of gas by rebel forces in Syria previously, the notion that there could be a chemical weapons factory in rebel-held areas of Syria is more than believable. It also seems more than plausible in these media sources that a strike on the factory could release the agent. Additionally, these media sources rely on the same reader ignorance and susceptibility as do western outlets, assuming the reader will accept whatever is written. This goes a long way on both sides. As always, if one wants to find out the truth, they must follow the evidence. However, it often isn’t clear what evidence is needed to do so. In order to prove one of the narratives about the Khan Sheikhoun attacks true, it is necessary to determine what evidence would prove one conclusively wrong. The major difference between the narratives is the method of delivery of the agent – either an strike carried out with ordinance containing agents delivered by air or an explosion which triggered the release of it from a factory or warehouse that had the agent stored inside- and the difference in dispersal area between an aerial and ground release. 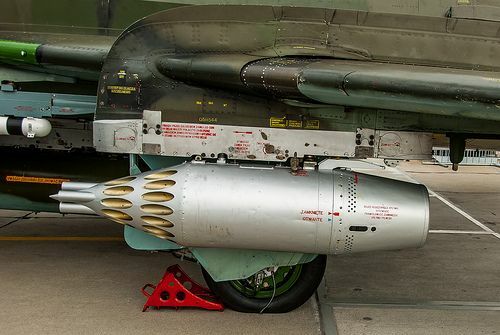 The UB-32 Rocket Pod under the wing of a SU-22 fighter/bomber used in the April 4th attacks. Therefore, in order for the Syrian Airforce to have delivered sarin weapons it would have done so either by a sarin-filled bomb, or sarin-filled rockets. A bomb would contain several hundred liters of the compound and, if used, cover a significant area. None of the footage or eyewitness testimony corroborates this. According the Syrian media, “the Su-22’s bombs are unique and cannot be filled with any chemical substances, which is different than bombs dropped from attack helicopters.” Instead, the claim is that the Syrian plane used several small rockets. Indeed, images of small craters created by the rockets were used to show Syrian Air Force culpability. Other photos showing the impact site from a different angle were published by news agencies such as Reuters. If this were the case, the Syrian Su-22 fighter/bomber would have delivered them via an underwing rocket pod loaded with sarin rockets. In order to make this connection, evidence that the facility at Shayrat still had Sarin production or storage capability – something denied by the OPCW, would be necessary. Additionally corroborating evidence would come in the form of information about the size and movement of the gas after the strike. These rockets, according to a conversation with John Gilbert, a senior science fellow at the Center for Arms Control and Non-Proliferation, would contain a few liters of the sarin compound and after hitting would cover a area significantly smaller than a sarin bomb. Gilbert also noted that weather conditions would play a significant role in the dispersal of the chemical agent as well. According to Meteoblue wind speeds in Khan Sheikhoun had been steady dropping from the day before which clocked 11 mph winds, to under about 7 mph by mid-day. Another factor mentioned by Gilbert would be the presence of a temperature inversion which traps warm air near the earths surface. Usually concerning when present over polluted cities, the presence of a temperature inversion would have increased the efficacy of the gas by keeping it towards the ground. Conditions on the 4th of April, 2017 show that it had precisely the opposite conditions for an inversion. Usually an inversion accompanies cooling temperatures, as the air will warmer than the ground as it radiates away. The temperature was rising on April 4th and the humidity was decreasing rapidly. Also, pictures from that day do not evidence an inversion. Though some of the evidence does not support the claim of rocket-based use of sarin it is till possible. But how plausible is the claim that a strike on a factory containing sarin or other agents would cause it to be released? First, it is important to note that most of the nerve agents used are binary chemical warfare agents. The binary name derives from the fact that the agents are made by mixing from several different components within a few days of use. For example, binary Sarin is made by combining isopropyl alcohol with methylphosphonyl difluoride, among other additives for ease of use. Binary systems are used for two reasons, protection of logistics personnel and materiel as well as shelf life. Waiting to mix the chemical before use allows the binary compounds to be stored much longer, and therefore manufactured cheaper. The lack of a fireball of igniting isopropyl alcohol suggests one of two things about the facility. Either it did not contain the binary agents, or the chemicals were not held in binary states. If the chemicals were not held in binary and simply kept already mixed in some form of container, the puncturing of those containers by concussions from nearby rocket hits or even a direct hit, could release the agent in the nearby area. The last bit of evidence available is the picture of a crater near a warehouse with silos that is the supposed site of the attack. If this is the warehouse that the Syrians claim was destroyed and release the chemicals, then evidence should remain. A video showing a reporter outside the area shows that little, if anything, was inside the silos when they were hit. It is worth noting that the damage shown in the area already existed before the April 4 attack, as shown by TerraServer imagery from February 2017. However, the area of town in which the silos are located is at the northern edge, whereas Syrian and Russian reports claimed the rebel warehouse hit was on the eastern outskirts of Khan Sheikhoun. With all these discrepancies, until the UN investigation team is able to access the site of the attacks, there is simply no way for anyone outside of those with more capable, but likely secret, means of procuring that information. The UN team would have to geo-locate the impact crates, gather evidence of the remains of the munition, locate all the victims and geo-locate their position at the time of the attack, and determine wind and temperature impacts on dispersal to make a case that would be enough to stand up in an American court of law, for instance. But without making that information available for public scrutiny, any military action taken by any state is premature at best, and illegal at worst. While it is common practice in the war of hearts and minds to portray one’s adversary as having no merit in any claim made, in this instance, both claims are at least plausible and also full of holes. However, neither side is willing to give the public the information necessary to make informed and intelligent claims, much less have the confidence to back a military response. Yet we see media pundits and politicians alike line up behind Donald Trump’s attack and praise it. While the victims of the attack bore the brunt of this tragedy, the effects will linger longer and spread wider than Khan Sheikhoun. This failure to mandate an evidence-based system that ensures that the government only makes decisions and takes military action (if not any action) after all the information is reviewed and analyzed by public and private organizations and groups makes us less safe and kills other people. No longer should be people be forced to choose between trusting one source without evidence or trusting another without evidence. This form of “trust us” media and government produces in the public the distrust of media that fuels the “fake news” phenomenon and general discontent and distrust the public has in media and government alike. In short, it is bad for civilized society. As the world has learned many times, most recently in 2003 in Iraq and 2011 in Libya, things change when the most powerful military in the world begins to flex its military muscle. Surely, one cannot escape noting the hypocrisy of a government that claims it has no money for social programs but is willing to spend hundreds of millions of dollars in weapons without having ensured that the party punished is actually the party responsible. Even the hypocrisy of this situation aside, if a nation is going to claim that it has the right under R2P to attack a state that is committing serious international crimes, it has to buttress its claims with publicly available evidence, not a few pictures of victimized children which boils any human’s emotional blood. In the case of the chemical weapons attack on April 8, 2017 in Khan Sheikhoun, no such evidence has been provided either before or after the attack, nor is any currently available. Therefore, in no uncertain terms, it was a premature and illegal action taken by the government of the United States under one of the founding principles of the entire United Nation project: non-aggression. Once again, the United States government has shown that it does not really believe in the principles of the United Nations, though lip service is often paid to the same principles.